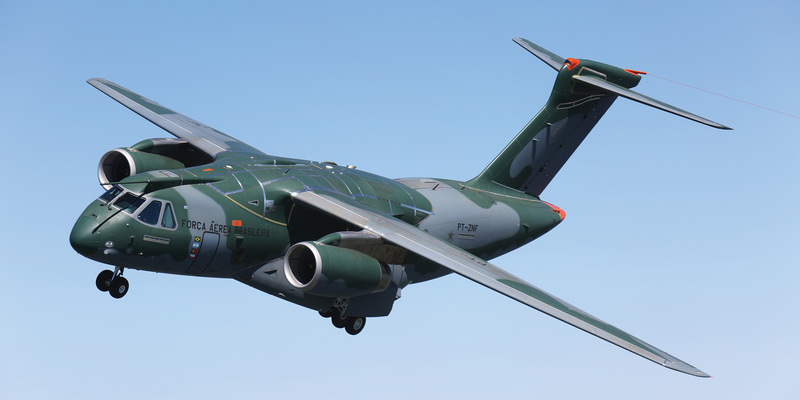 The prototype Embraer KC-390 made its second flight on October 26, after an eight-month hiatus. The Embraer KC-390 program has returned to flight-test status after a slowdown caused by Brazil’s financial crisis. The prototype tanker/airlifter flew from the manufacturer’s test center in Gavião Pexioto, Brazil, on October 26, the second time it has flown since its maiden flight on February 3. Embraer (Stand 2260 and Chalet A7) planned to fly the prototype again before the Dubai Airshow. Embraer’s earlier program schedule called for it to certify and deliver the first KC-390 to the Brazilian Air Force in 2016. It announced the slowdown in July, citing the devaluation of the Brazilian real and government spendingcuts. With the resumption of flight-testing, the manufacturer now expects to certify the aircraft in 2017 and begin deliveries the next year. The eight months between test flights were not wasted. Embraer used this period “to do some normal corrections” that came to light during the development effort and conducted ground vibration tests to validate aeroelastic models, Silva said. Tests are ongoing in an avionics rig, mission systems rig and “iron bird” systems integration bench with full cockpit, landing gear system and electric and hydraulic flight controls. During the second flight of about an hour’s duration, Embraer tested the initial flight profile, flight-control responses and general aircraft behavior. The manufacturer plans to introduce a second prototype to the flight-test campaign early next year. The two aircraft will perform about 2,000 flight hours. During the campaign, Embraer will also use two structural test vehicles for static and fatigue testing and partial test vehicles for different structural and systems testing, Silva said. The Brazilian Air Force plans to acquire 28 KC-390s, a requirement that remains unchanged, Silva said. He declined to comment on the manufacturer’s “ongoing campaigns” to interest other countries, but said declarations of intent by five identified program partners–Argentina, Chile, Colombia, Czech Republic and Portugal–remain intact for 32 additional aircraft.